When you are discussing an 18.4-inch notebook that comes in at ten pounds, discreet is likely not the correct choice of adjectives. There is little to be discreet about with the GT80 Titan. This is a device crafted for a single purpose, and that is to be used as a desktop replacement which can handle practically any gaming you can throw at it. The first thing that hits you when you see the GT80 is the imposing size. Then you open it up and are greeted by the single design decision that really sets this device apart from all others. The keyboard is really one of the focal points of this design. Going with a mechanical keyboard was a decision that clearly impacted the entire layout. With the depth required for the switches and their movement, really the only place for the keyboard is at the front. This might seem out of place when comparing it to traditional notebook computers, but when you step back and look at the device for what it is, the design makes a lot of sense. When you are sitting at a desktop, you don’t sit with your hands hovering over the table to do your typing. Your keyboard is in front of everything else, as it is on the GT80. The fact that this is a mechanical keyboard is the icing on the cake. Generally when I am reviewing laptops, keyboards range from mushy to good, but with the Steelseries keyboard with Cherry MX Brown keys, the key feel is just so much more tactile. I do the majority of my writing on a desktop computer because I appreciate the much better keyboard experience, and the GT80 Titan captures a lot of that into a gaming notebook. I do find the key noise to be a bit too much (even though these are not audio feedback switches like MX Blues), but considering the extra feel, it is likely something I could easily come to terms with. For those concerned that the front mounted keyboard means there is nowhere to rest your wrists, fret not. MSI includes a wrist rest in the box which mounts on the front. Moving the trackpad to the right side to create room for the keyboard is another design decision that is interesting. I had no trouble at all adapting to the new placement, and for a lot of what I needed the trackpad for, having it vertical was actually quite handy. There are two physical buttons at the bottom for left and right click, and in the upper left corner is a numlock area on the trackpad. Tap there, and the LED backlighting turns on a touch based number pad. After praising the inclusion of an actual keyboard on the laptop it would seem odd to hear me praise a touch number pad, and I won’t. It would be useful in a pinch but for anyone who does a lot of data entry, a real number pad would be much more useful. I can’t see any alternative here though, since having this as physical keys would leave no room for the trackpad. But again, if we step back and look at the GT80 Titan for what it is, the decision is fine. This is not a device to enter numbers on a spreadsheet. The GT80 Titan is a desktop replacement focused on gaming, and as such, the odds are that it will be used with a mouse. That frees up the number pad to be used for keyboard mappings of commands in games. 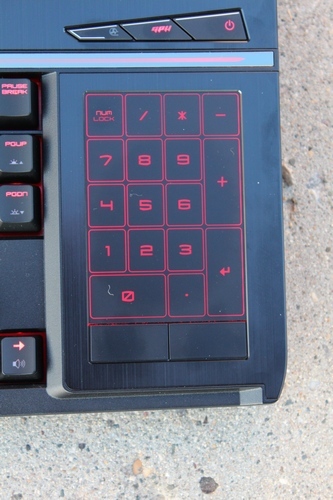 I think MSI could do more with this, and include custom software to do macros on the numpad as well. The Steelseries keyboard includes software for key mappings and bindings on the keyboard, but it does not extend out to the trackpad. It would be nice to see this utilised more like the Razer SwitchBlade UI. Stepping back again to take a look at the device as a whole, MSI has used aluminum as a feature of the client facing materials, and kept the underside and sides of the device as plastic. The LCD lid is one of the aluminum pieces, and it is accented by red backlighting and the MSI logo. It has a brushed finish on the top which is a nice touch. The sides and back of the device are dominated by the large cooling vents which are needed to expel the tremendous heat that this notebook can generate when running at 100%. There are actually eight heat pipes inside in order to move all of the heat to a location where it can be removed. If you are looking to connect peripherals, MSI has you covered there as well. The GT80 Titan has an HDMI 1.4 port on the rear, as well as two mini DisplayPorts, Gigabit Ethernet, and the A/C in. The left side has three USB 3.0 ports, a SD card reader, a SPDIF audio output, and two 3.5 mm jacks for headphones out and microphone in. There is even a Blu-Ray burner on the left side, because when you have this much real estate to work with, you may as well cover every possibility. The right side features another two USB 3.0 ports. With a total of five USB 3.0 ports, the GT80 Titan should be set for whatever devices you want to connect to it. Opening the display up shows off the MSI dragon logo on an aluminum top plate. 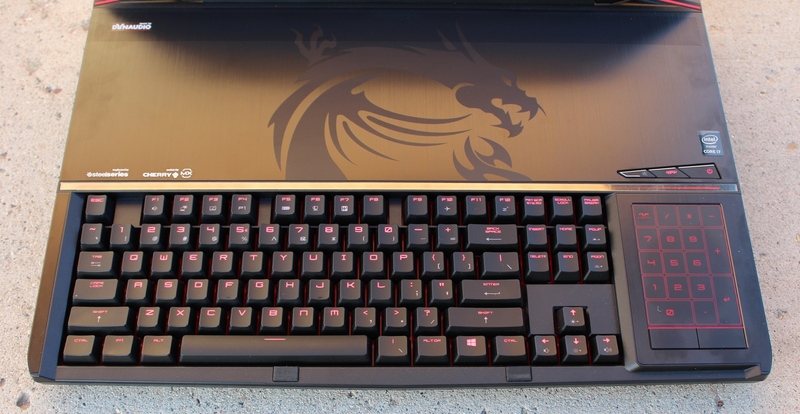 Personally I am not a fan of some of these things on gaming systems, but that is personal preference, and MSI has done a fairly understated job of the logo with the dragon being in a shadow relief compared to the glossy black of the rest of the plate. The keyboard backlighting is in red, as is the red light accent stripe which runs along the top edge of the keyboard. Above this stripe on the right side is the power switch, as well as a hardware switch to disable the NVIDIA GPUs and switch to integrated graphics (there’s no Optimus on the GT80 Titan) and a switch which turns the system cooling to 100%. The latter switch is one that I wish all gaming manufacturers would provide, as it gives the end user the choice about cooling rather than a software policy which may or may not keep the components cool enough. MSI has also designed the GT80 to be end user serviceable. The top plate can be removed with just two screws, so you can get access to extra memory slots and the storage which features two M.2 SSDs in RAID 0 as well as a 7200rpm 1 TB drive from the factory. The bottom is removable as well to get access to more memory, as well as the MXM graphics cards for future updates. At the moment, there’s no upgrade path from the GTX 980Ms that it has now, but in a year or two users will be able to source new MXM cards with newer GPUs, and they will also come with the correct cooling solution. I think that’s a nice touch when you consider the large investment in a device like this. With total dimensions of 18” x 13” x almost 2” thick, the GT80 Titan lives up to its Titan name. But it is easy to get caught up in the size, and not look at the total package which is pretty smartly done. This is the first gaming laptop to feature a mechanical keyboard, and the implementation of it was risky but in my opinion has paid off very well. I'm surprised to see the temperature and cooling of this notebook. I thought all gaming notebooks with high-end GPUs had inadequate cooling, thus leads to high temps. Clearly, I'm wrong here. More important than dedicated fans is the actual layout and capacity of the heat pipes and heat sinks. As an owner of an M18x R2 (i7 Extreme), and a few other notebooks, I can say that the shared-cooling solution is much better. Some games are more GPU-heavy, some CPU-heavy, and that goes for other workloads too. Sharing the cooling across multiple devices may help you achieve better performance in the long run.